Bible Society-backed project Open the Book has announced that 2000 registered primary schools are now taking part in the scheme and more than 400 schools have registered since October 2014. 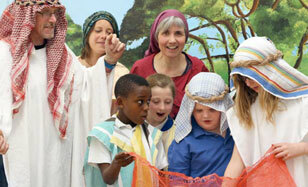 There are also 11,000+ volunteer Bible storytellers now going into schools across the UK. Open the Book began in Bedford in 1999. It’s a three-year rolling programme of themed and dramatised Bible stories, which are presented by teams of volunteers free of charge to primary schools. In 2013, Open the Book became part of Bible Society in a bid to expand the project to more schools. Volunteers present Bible stories in primary schools in an accessible and enjoyable way and provide a resource that assists schools in meeting their statutory collective worship obligations. James Catford, Group CEO of Bible Society said: "This is an amazing achievement and Bible Society is thrilled that 2000 primary schools are now taking part in Open the Book. The Bible’s contribution to our culture – language, literature, the visual arts and music – is immense. The Bible enriches life, and every child should have the opportunity to experience it." Open the Book programme coordinator, Dianne Brookes, said the 2000 school target had been achieved much faster than expected. She said: "Good news travels fast. Open the Book is exactly the type of good news that people like to tell others about. It’s easy to get involved and great fun to do." Open the Book volunteers use drama, mime, props, costume – and even the children and staff themselves – to present the Bible stories in lively and informative ways. All storytellers agree to a strict code of practice and follow the guidelines in the Open the Book handbook. They don’t teach or preach, but simply tell stories. Volunteers stick to the script and outline for each session and present the story simply, without addition or improvisation. They allow each story to speak for itself, as a Bible story, not as a sermon. They liaise closely with schools and show respect and sensitivity to those of other faiths.